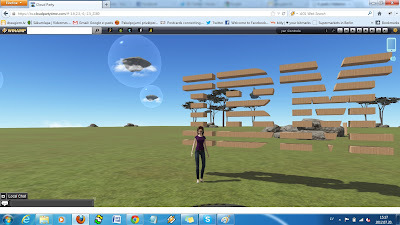 While I was traveling in between the new 3D virtual World Cloud Party’s islands I accidentally detected IBM’s island. They just opened their Cloud Party IBM Sandbox like island. IBM (International Business Machines Corporation) -one of the biggest companies selling computers, hardware and software- is also known to be quite active in the Virtual World field. At the moment their island is little empty and there is not so much 3D stuff you can enjoy, but it is quite huge, so I predict that there is going to be some cool 3D objects and mesh soon. I talked to the owner and they announced this is a official IBM test cloud island, to get to know the technology and maybe start some projects in the future. The island is free to visit and just a modern Browser like Firefox or Chrome is needed. Click here to get to know IMB’s cloud island, and if you are lucky you can already meet some IBM folks at work.